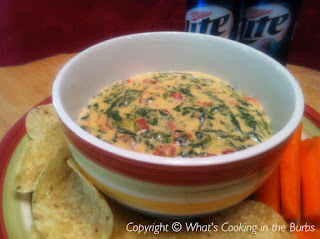 This has got to be one of my new favorite dip recipes. It's so simple to prepare and I make mine in my little dipper crock pot. I also have convinced myself that it is somewhat "healthy" since it has spinach in it! Serve with tortilla chips and fresh veggies and you have a great appetizer! Toss all ingredients into your crock pot. *If you don't want to use a crock pot you can microwave until combined. * Cook on high for 45 minutes or until well combined and warm. Wow, thiis is simple to make and it must be healthy - somewhat! You could use baked pita chips. We are hosting a party beginning today, "What'd You Do This Weekend?" This would be a perfect link to the party. Come on over and grab a button. Then come back each Monday and ramble on about your weekend in any way you choose.